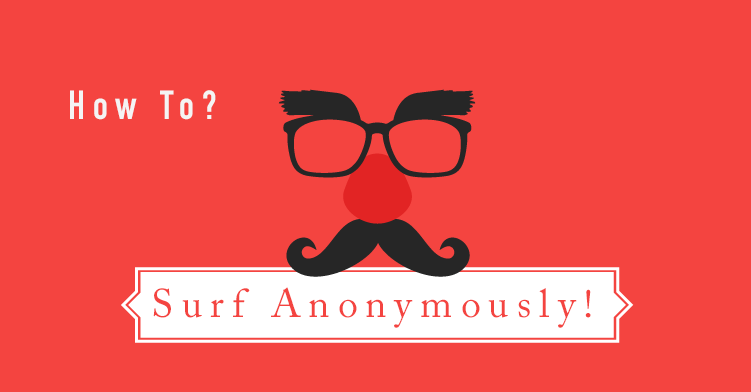 Surf Anonymously Online For more information on WHY to surf anonymously, do read our later chapters which explain what often does go wrong when you innocently decide to stumble upon private web pages with unscrupulous owners. If a user does something illegal, local or federal authorities can sometimes catch them in the act, and it usually always involves users who forsook their anonymity by committing just one foolish mistake. Even if your intentions in surfing are harmless, it’s just not wise to expose your private information to various users around the world; and this information about yourself is stored in your home device(s), as well as your ISP connection, which contains your name, address, phone number and location, among other identifiers. It’s also a bit empowering to surf the web anonymously free from targeted ads and without worry of having information stored on your computer. The problem with using “anonymous browsers” on Firefox and Chrome “Incognito/Private” is that this only prevents your browsing history from being saved. However, just because your Internet activities aren’t being recorded on YOUR PC doesn’t mean it’s anonymous. You’re still leaving a trail behind. Even users that are using the surface web might consider deleting cookies since these are tracking files that record information on you, and most browsers auto-accept cookies. Using the CCleaner program can clear cookies, but you need anti-tracking software to opt-out of all these ad networks that are scouting your online behavior. (Some popular programs for surface web anonymity include Privacy Badger, Ghostery, or Disconnect) Most people don’t realize that these little “cookies” are basically following them around the Internet. At some point, you’re going to realize that just because you can wipe your device clean doesn’t mean you’re actually going to be anonymous in the eyes of others. Your actions can still be tracked and recorded by your Internet Service Provider. There are two important steps for surfing the Darknet: connecting and anonymously surfing. Connecting to the Darknet requires either special software or configuring a proxy server. You must use a private, anonymous browser to access the deep web. However, most users will use two means of anonymity, the second being a “virtual private network” that can mask your IP address which is the identifying information you leave behind. We will discuss the difference between these technologies in the next chapter. In case you’re wondering, it is possible to surf a darknet using your favorite browser like Firefox or Chrome. If you’ve ever tried to do this outright, you probably know that the browser will send a message stating that it cannot load the content. This is because ordinary browsers typically have high- level security and privacy settings, as well as a firewall set up to protect users from potentially unsafe sources. Additionally, the various web servers you encounter on the hidden internet may also have various security and privacy settings that you must adjust for, in order to access them. There are ways to force an ordinary browser to become a dark web surfing tool. You would basically have to download TOR and then configure Chrome or Firefox to work with your new TOR-altered security settings; namely in proxy settings. Most users would not attempt this, since it’s easier and safer to simply install Tor and use a Tor-ready browser that guarantees anonymous browsing. Using an ordinary browser and constantly have to adjust, install, and turn on private browsing can also be a headache. Some plugins are now being offered for Firefox and Chrome and they reportedly block third-party cookies, do not store browsing or search history and block all trackers. Also Read: What is the Deep Web and Why Is It Worth Exploring? However, the most effective way to “go dark” when surfing Darknet is to download and use the TOR network plus browser. This is the focus of our next article.